Price slashed by $10,000 - making it $7,300 below recent professional appraisal! Optioned with the significantly better-performing 289 CID Ford V8, 4-speed transmission, and a factory hardtop, this Tiger is believed to be a California car since new. Bought by its latest owner in 1996, the previous owner had just rebuilt the transmission and clutch. In 1998 a new exhaust system was installed. In 2008 the car received a new walnut wood dashboard and a new electrical harness. Last October it had a full brake system overhaul ($4,200). Truly a sports roadster with performance capabilities, the Tiger is a car that was developed by former British giant Rootes in conjunction with Carrol Shelby, much like the instantly recognizable A/C Cobra. The Tigers came with either a 260ci V8, or a 289ci V8 - both sourced from Ford. A mild refresh occurred after Sunbeam built 3,700 cars, with squarer doors, a vinyl convertible boot, and added cabin ventilation. These cars are now known as Tiger Mk IAs, and 2,708 were built - this Tiger is one of those. Based on the 4-cylinder Sunbeam Alpine, a leading sportscar value in the '60s, the Sunbeam Tiger epitomizes the notion of a “big engine in a small car”. The Tiger featured either a Ford 260ci V8 or 289ci V8 shoe-horned into the narrow engine bay. The larger 289 CID (4.7 L) Ford engine improved the Tiger's 0–60 mph time to 7.5 seconds, and increased the top speed to 122 mph - great performance for the era. Almost the entire production run of Tigers (1964-1967, 7,128 units) was shipped to the American market where it remains a popular restoration (and hot rodding) selection. The cowl-mounted serial number tag confirms this Tiger’s late-1965 model year production, although it’s titled as a 1966 model. In the 60’s, new cars were sometimes titled and registered based on their customer delivery date rather than their build date, a practice particularly prevalent with low-volume imports such as Sunbeam. Though perceived as a comfortable road car, with good brakes and adequate acceleration, Alpines were also raced with great success. Tigers remain both charismatic and undervalued collector cars. Ford mechanicals make them robust and easy to maintain and modern fixes are plentiful, which brings to mind the dearth of stock examples. Hard tops are very desirable. 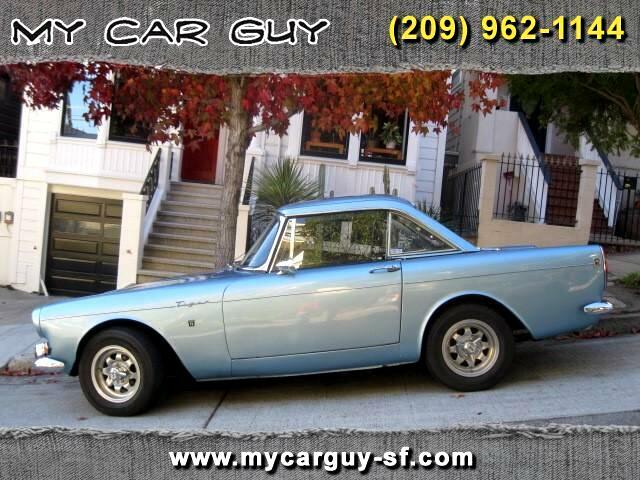 We offer this enjoyable and appreciating Sunbeam Tiger for $49,900. Note: We just had the car professionally appraised: "...has been professionally restored back to near perfect, as factory condition....very desirable option package that includes an upgraded 289 CID V-8 engine, 4-speed manual transmission, and it is in very good overall condition". The appraisal came in at $57,200. Current Hagerty Valuations of #3 Good $71,500, #2 Excellent $95,500, and #1 Concours $132,000. As much as possible we have tried to be accurate and show flaws in photos; however, research on these cars can be confusing. Message: Thought you might be interested in this 1965 Sunbeam Tiger.